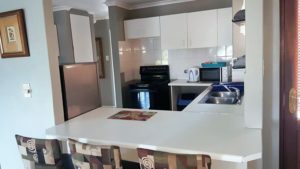 Heide Self-Catering Flats are situated at Serengeti Complex in Bellville, close to the Cape Winelands and all the major attractions Cape Town has to offer. Accommodation comprises one-bedroom apartments, two-bedroom apartments and three-bedroom apartments accommodating 2 to 6 guests respectively. The apartments are equipped to meet your basic needs, stylish yet comfortable, secure and very neat. Each apartment features a fully equipped kitchen, bathroom, lounge with TV and selected DSTV channels. Bedding is provided. Groups of up to 30 guests can be accommodated. Facilities available in the complex includes a swimming pool, braai facilities, self-service laundry facilities and shaded carport parking for 1 vehicle behind security gates. Bellville is a vibrant northern suburb of Cape Town, Western Cape. It is ideally situated close to the Cape Town International Airport, a number of golf courses, wine routes, entertainment venues, and shopping complexes, making it a worthwhile holiday destination in the city. In recognition of exceptional service Heide Accommodation in Bellville, Cape Town is hereby awarded a Certificate of Excellence.